At 7’4″ and 500 pounds, Andre the Giant could have been famous for his size alone. His drive, talent, and ambition, however, proved to be as big as Andre himself, and the wrestler became legendary for his achievements in and out of the ring. Andre was born Andre Rene Roussimoff in Grenoble, France on May 19, 1946. His parents, Boris and Marian Roussimoff, and four siblings were of average size. Andre, however, suffered from acromegaly, a disease that results in an over abundance of growth hormones. Also known as Giantism, this disease caused Andre’s body to continue growing his whole life, and by the time he was 17, he stood 6’7″. 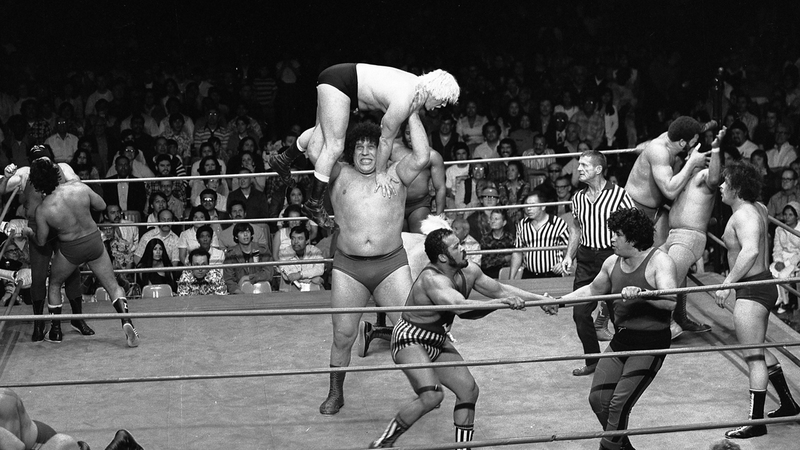 Due to his immense stature, it seemed inevitable that Andre would excel in the wrestling world. He had just started to make a name for himself in the ring as “Monster Eiffel Tower” or “Monster Roussimoff” when French-Canadian wrestler Edouard Carpentier first laid eyes on him. Carpentier was impressed with Andre’s raw talent and decided to bring him to North America. Andre began wrestling under the name Jean Ferre in Canada for Grand Prix Promotions. In a short time, Andre went from the undercard to being a headlining name. Inspired by the movie King Kong he acquired the nickname, “The 8th Wonder of the World,” which stayed with him for the rest of his career. By the time Andre had performed in front of 20,000 wrestling fans in Montreal, his legend had reached Vince McMahon, Sr. at the World Wide Wrestling Federation’s (WWWF) headquarters. McMahon would forever alter Andre’s life. In 1972, McMahon signed Andre to wrestle for the WWWF and changed his name to capitalize on his colossal size. “Andre the Giant” became one of the most recognizable names in wrestling. Andre performed under his new name at Madison Square Garden, where he easily defeated his opponent, Buddy Wolfe, without breaking a sweat. Before long, Andre’s venues were sold out and wrestlers lined up to perform in his shadow. As Andre’s fame grew to stardom, he was featured in Sports Illustrated in the largest feature they had ever published. In 1987, Andre drew the biggest crowd in WWF (formerly WWWF) history thus far. A record 90,000 fans packed the Pontiac Silverdome in Detroit, Michigan to watch Andre wrestle fellow legend Hulk Hogan in the main event of WrestleMania III. In all, Andre participated at six WrestleManias and faced some of the toughest opponents in the business, including Big John Studd and Jake “The Snake” Roberts. For many years, he was known as the “Uncrowned Champion,” until he found his place in infamy and held the WWF title for the shortest reign in history. This wasn’t the only championship Andre captured – he also won titles in the (NWA), (IWA) and the WWF Tag Team Championship. Andre’s fame also opened the door to Hollywood. He made his acting debut in 1975 as “Big Foot” in The Six Million Dollar Man. Andre enjoyed the experience and went on to appear in television shows including B.J. and the Bear, The Fall Guy, and The Greatest American Hero, and movies such as Conan the Destroyer, Micki and Maude, and Trading Mom. His favorite role, and the one for which he is best remembered, was the lovable giant “Fezzik” in Rob Reiner’s classic, The Princess Bride. Andre’s last television appearance was on a celebration of 20 years of NWA/WCW wrestling on TBS. Sadly, over the years, the effects of acromegaly had continued to wear down his body. Eventually, his immense size was just too much for his heart, and Andre the Giant died in Paris, France in his hotel room on January 27, 1993. His ashes were later taken home and spread over his North Carolina ranch.